The photo above is from the NYS Archives, and it's from a hop farm near Cooperstown around 1900. In Ostego County in the town of Madison, New Yorker James D. Coolidge planted the first hops yards in 1808. His commercial opportunity came fourteen years later when blight, insects, and unfavorable weather decimated crops in England. This increased the demand for New York's hops in both national and international markets. The opening of the Erie Canal in 1825 and the influx of German immigrants during the first half of the nineteenth century also increased the domestic demand for hops. In 1850, New York shipped 750,000 pounds of hops to British markets. In 1880, all but sixteen New York counties were growing hops. Ostego, Madison, Herkimer, Schoharie, Chenago, Oneida, and Montgomery Counties were the leading producers of hops, with Ostego County producing more hops than any other county in the United States. 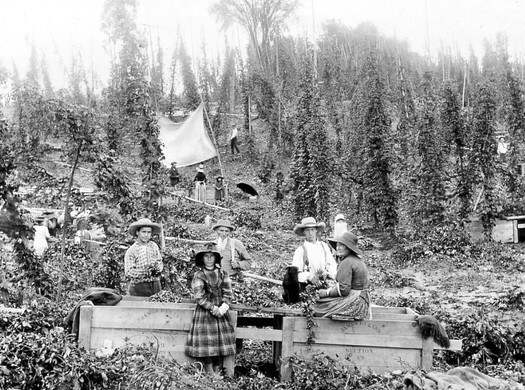 Disease and Prohibition pretty much killed off the hop growing industry in New York, and today most of the hops grown in the country are produced out in the Pacific Northwest. But the crop is making a comeback here, a rise prompted in part by the state's farm brewery license, which requires breweries operating under the license to use a certain percentage of New York-grown ingredients. Casey wrote about the rebirth of the New York hop industry a few years back. Among the local farms that are part of the re-hopped New York is Indian Ladder Farms in Altamont, which is growing a variety of hops. (You might remember the Indian Ladder Farms IPA at the Pump Station last year.) ILF recently finished this year's hop harvest and posted some photos of the process on its Facebook page. Psst: It's OTSEGO County, not Ostego, and not to be confused with Oswego or Owego.